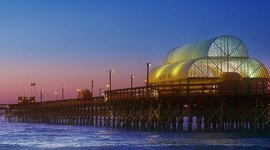 Jutting out into the waves of the Atlantic Ocean, the numerous Myrtle Beach piers offer anglers an economical option for saltwater fishing. You can fish far past the shore without booking an expensive charter. They’re also a great place for sightseeing and people-watching – a breezy way to enjoy the ocean without getting sand in your shorts. 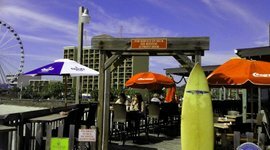 Many of these Myrtle Beach piers are hopping with live entertainment, adult beverages, refreshments, and full-scale dining. The good news is, wherever you vacation along the Grand Strand, there’s pretty much always a pier in walking distance. 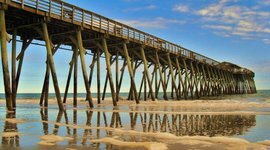 We’ve highlighted eight piers that stretch out into the Atlantic, starting at Garden City Beach in the south, all the way to Cherry Grove up north. 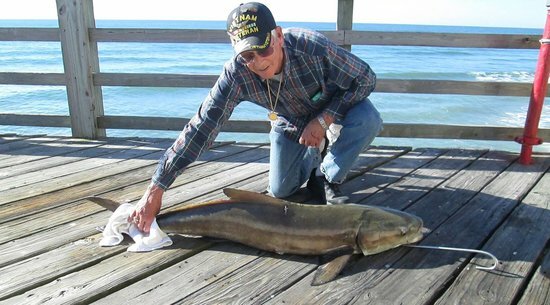 Some crazy fisherman reeled in a 1,780-lbs tiger shark off this Myrtle Beach pier, breaking the world record. Another caught the largest tarpon at 98 lbs. 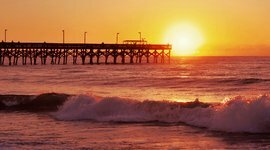 Located in the Cherry Grove section of North Myrtle Beach, this pier hosts several competitive fishing tournaments every year, and features a newly remodeled, full-service tackle shop. Along with Myrtle Beach fishing, it’s a good pier for crabbing too, especially Blue Crab. For non-anglers, there’s ample room for strolling as the pier extends 985 feet out onto the Atlantic ocean. There’s also a two-story observation deck, and the Boardwalk Beach Cafe. Price to walk: $2 per person. This isn’t a “shhhhhhhhhh you’ll scare the fish” kind of pier. This local landmark anchors the heart of lively Garden City Beach. The town boasts family-friendly amusement, colorful beachwear stores, eateries, and nightlife all at the intersection of Atlantic Avenue and Waccamaw Drive. Mind you, serious fishing goes on at this Myrtle Beach pier – as does serious socializing. There are two spots for entertainment, with karaoke and live musicians at the Paradise Cafe deck at the base of the pier, and a band pavilion at the end with a full-service bar. There’s also a large arcade on site with skee ball, video games, and carnival-style attractions. Price to fish: $9.50 for adults, $4.75 for ages 12 and younger, $9 for road rentals with a $15 deposit (no fishing license required). 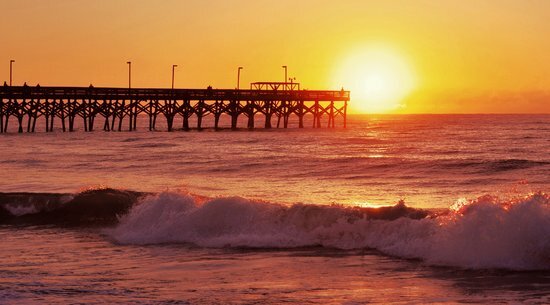 Even more secluded than its immediate pier peer – Springmaid – the Myrtle Beach State Park Pier resides in a protected, undeveloped portion of beach, making it a nature lover’s paradise. 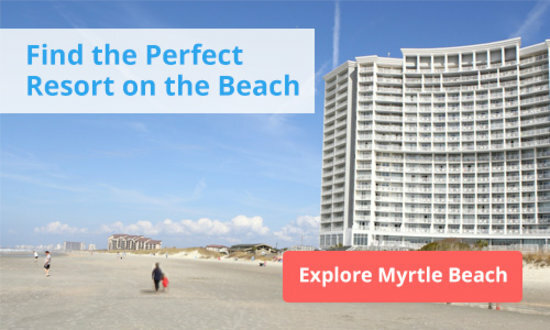 It’s also a prime spot for Myrtle Beach fishing, as crab and fish come here in droves. And even though it’s a state park, free WiFi is available in the pier gift shop. 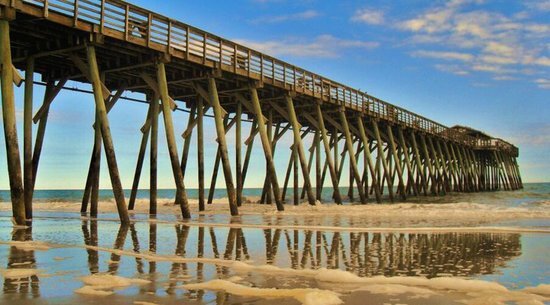 Price to walk: Pier is free, but you’ll have to pay to park at Myrtle Beach State Park. It’s $5 for adults, $3.25 for senior, $3 for ages 6-15, and free for kids under 5. Price to fish: $5 for adults, $2.50 for ages 6-15, free for kids under 5. Self-described as the “longest wooden pier on the East Coast,” Apache Pier stretches 1,205-feet over the sea within the oceanfront Apache Family Campground. It has a fun, family-friendly vibe. Sure there’s serious fishing going on here, but the themed dance parties, live music, and karaoke take center stage. There’s a $3 cover charge for entertainment, scheduled 8-11 pm. There’s also a full-service bait and tackle shop (including rod rentals), and an arcade featuring interactive video games and old school games such as air hockey and skeeball. 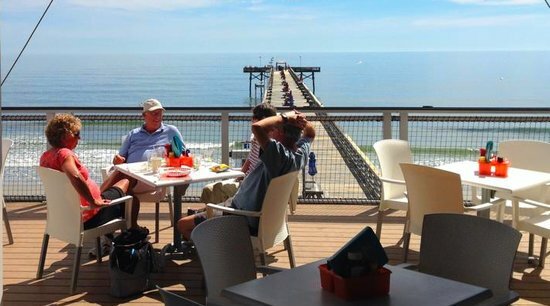 If you get the munchies, Croakers at the Pier serves breakfast, lunch, and dinner, but is only open seasonally, so call (843) 497-5331 for operating hours. 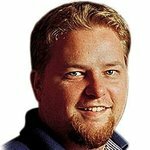 Price to walk: Free to walk, $3 cover for entertainment. Don’t want to catch your own dinner? Pier 14 is a restaurant, lounge, gift shop, and bait and tackle store. It’s a full-service, sit-down kind of place with a large deck that gives you stunning panoramic views of the Atlantic. The menu includes fresh seafood, along with steaks, pastas, burgers, salads, and options for “Little Mates.” You’re right next to the beginning of the new Myrtle Beach Boardwalk, so it’s a nice place to start or end your day. Price to walk: $1 per person, free for kids who are “shorter than our desk,” according to their website. Price to fish: $7 with your own rod, $15 to rent with a $20 deposit. And speaking of the Myrtle Beach Boardwalk, it all comes to an end at the 2nd Avenue Pier. This place was recently transformed from a bait shop, beach shack into to a sleek, modern affair with a beautifully appointed eatery, the Pier House Restaurant. And on the top floor, they built an open-air bar with a wrap-around deck, offering unfettered views of the Atlantic. Let’s not forget fishing, after all this pier in Myrtle Beach still offers a full-service bait and tackle shop. Price to walk: $1 per person. Price to fish: $9 with your own gear, $25 for rod rental package. 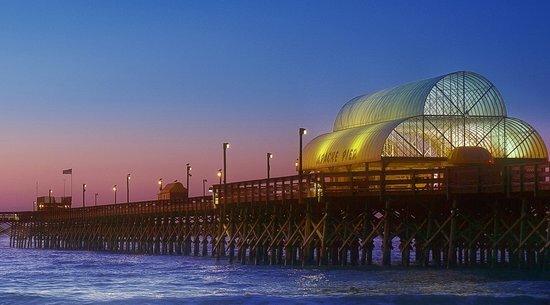 Quieter, and located in front of Springmaid Resort, on the southern tip of the downtown area, this Myrtle Beach pier is the longest one within the city limits – clocking in at 1,060 feet, and 36 feet wide, with a T-shape at the end. Springmaid Pier hosts various fishing tournaments, and is also home to Barnacle Bill’s Bar and Grill, the Tackle Box bait and tackle shop, and a general store/gift shop. Surfside Beach Pier is owned by the town of Surfside Beach and offers fishing, sightseeing, a tackle and bait shop and the new Surf Diner. There’s also lots of other great restaurants nearby, including River City Cafe and Bubba’s Fish Shack. 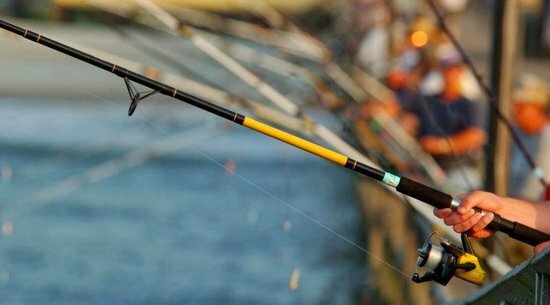 Rod rentals are available at Surfside Pier Outfitters, as is bait. It’s important to note that shark fishing is not allowed at this Myrtle Beach pier. Price to walk: $1 for adults, free for ages 7 and younger. Price to fish: $9 for bottom fishing for non-residents, $12.50 for float fishing for non-residents. 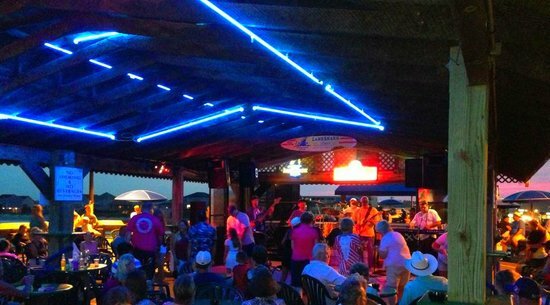 Enjoy live music at the Paradise Cafe Deck and a band pavilion with a full-service bar at the end of the pier. There's also a large video game arcade.